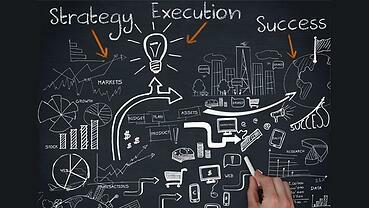 Strategy deployment, known in Lean circles as Hoshin Kanri or Policy Deployment, is a technique for ensuring that the strategic goals and objectives of an organization drive activities at every level. The goal is to ensure consistent direction and clear communications so that every employee pulls in the same direction (toward True North) at the same time. The approach aims to ensure that the corporate objectives (Strategy), management plans (Tactics), and the tasks accomplished by all employees (Operations) are in tight alignment. It serves as something of a feedback loop with goals and progress indicators coming from the top down, with results coming back from the bottom up. There are four critical phases of strategy deployment. This first part of our two-part post focuses on phase one. As you might imagine, strategy deployment begins with the creation of the actual plan. It is generally created to address several critical long-range goals of the company. Many teams focus on game-changing, breakthrough objectives that can be achieved in three to five years. The strategy shouldn’t be a laundry list of goals. Rather, it should call out three to five key objectives. Every company has a limited number of resources and energy. By picking just the most important objectives, that energy can be focused to ensure that something gets done to address your most pressing concerns, rather than spreading it across lots of goals thereby making little progress on each. You can add more goals gradually over time as your improvement culture grows and develops, but it's important to get started at a small and reasonable scale. Choosing what not to do is absolutely as important as choosing what to do. Goals can be incremental and evolutionary, achieved through a series of small but continuous improvements or they can be disruptive, dramatic and revolutionary. Both are valid forms of improvement to include in strategy deployment. It's important to remember that for both types of change, you need to carefully document the steps and the results. For incremental improvement in particular, it can be difficult to see the long-term impact of the work without intentional, thorough documentation. One of top level management’s most important jobs is to develop the strategic plan. But leadership teams are more likely to achieve the change they seek if they take the time to get consensus on the strategic plan from middle management. In discussing the plan broadly, leaders may get useful information and additional perspectives that result in a better plan. In addition, the opportunity to be part of the planning process helps to develop a feeling of ownership and accountability. For each objective, there should be Key Performance Indicators (KPIs) that will allow management to track progress. Keep in mind that what gets measured gets done, so carefully choose KPIs that will drive the behavior that you want. KPIs can (and should) scale down across the organization so that managers at all level are tracking and reporting on the metrics that tie their location's improvements to the strategic goals of the organization. Standardizing the way you measure and report on KPIs across departments is critical to achieving true organizational alignment. Each goal should have someone who is responsible for it. They won’t do all the work, of course, but they will serve to eliminate roadblocks, communicate progress, and organize the team. Strategy deployment software like KaiNexus makes it possible to keep track of who is doing what, send notifications to keep each team moving forward, and drill down on areas that need extra coaching. We can’t say that crafting the plan is the most important part of strategy deployment because each of the three phases is crucial, but it does come first and will lay the foundation for success. In the next post on this subject, we will talk about the next three phases, developing tactics, taking action and making adjustments.